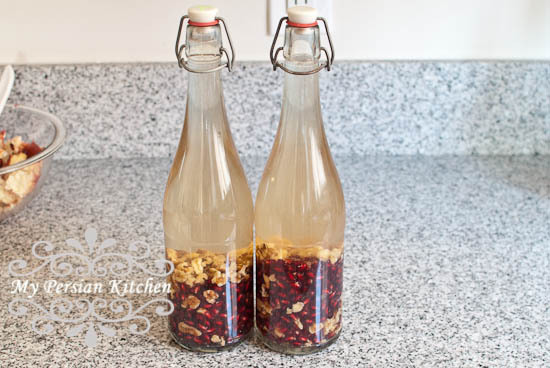 A few years ago a fellow co-worker shared her family recipe for infused tequila. First I was all ears because the tequila is infused with pomegranates; but what really grabbed my attention and sparked my curiosity, was the addition of walnuts. 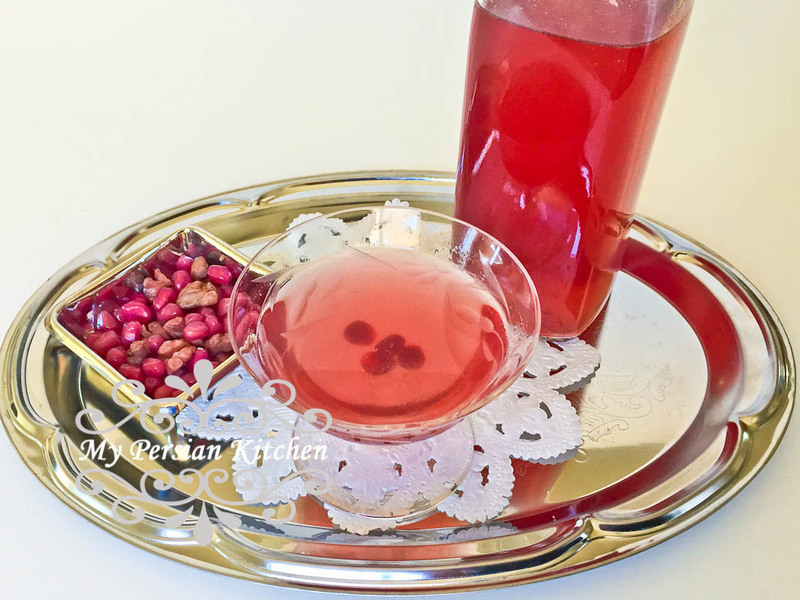 We Persians marry pomegranates and walnuts to make stew out of it, Mexicans on the on the hand infuse their beloved tequila with it. Every year I told myself I was going to make the tequila according to her directions. Somehow every year I’d think of it too late in the game. Well I was determined that it was going to happen this year. My co-worker did not lie, this Pomegranate and Walnut Tequila is good! Of course, because I am Persian and we are generally Vodka lovers, I also made a batch with some vodka I had laying around. More on that later! Thoroughly wash a glass bottle with boiling water and allow to dry completely. Then get your ingredients ready. 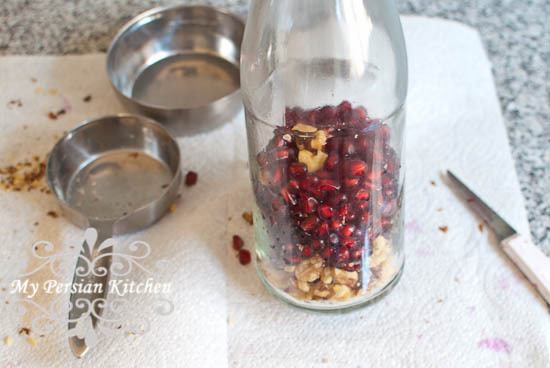 Place the pomegranates and walnuts in the bottle. Add your chosen tequila. The only suggestion here is to use the clear colored kind for maximum redness effect. Place in a dark cool place for four weeks. About once a week gently shake the bottle to move the ingredients around. After four weeks of resting this is what my bottles looked like! Strain the liquid. I really wanted the tequila to be clear, so I used two stainers and some cheese cloth, which was perfect. 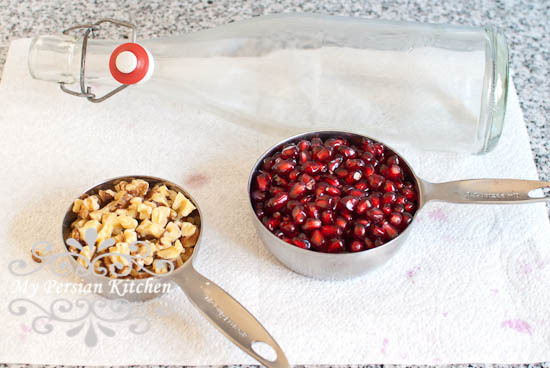 At this point you can discard the pomegranate arils and the walnuts. However, you can also place them in a cheese cloth and squeeze all the juice out. The actual arils are super super strong. But what really is over the top good is the walnuts. The first taste that hits your palate is the tequila and then comes the delicious taste of the walnut. SO GOOD! 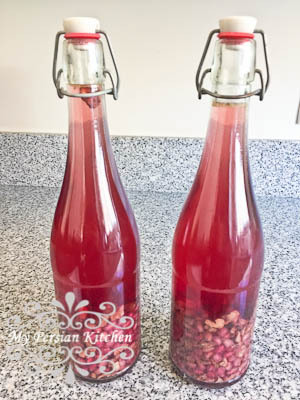 Enjoy your Pomegranate & Walnut Tequila as a shot or with your mix of choice! Thoroughly wash a glass bottle with boiling water. Allow to dry completely. 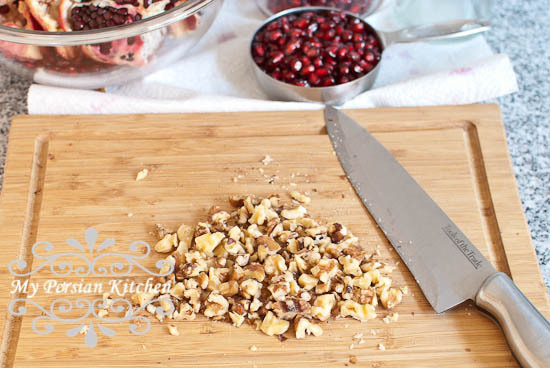 Rough chop walnuts then add to bottle along with pomegranate arils. Allow to sit in a dark cool place for four weeks. 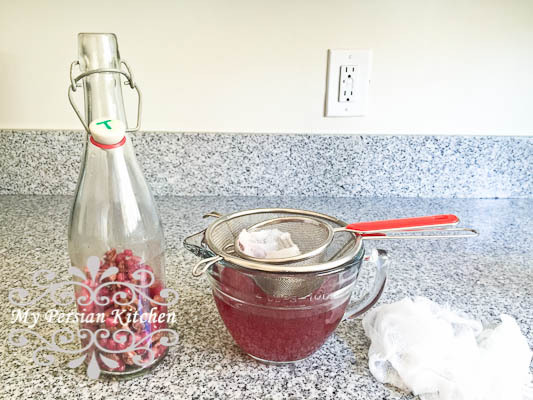 About once a week gently shake the bottle so that the ingredients move around. Strain the liquid using a combination of strainer and cheese cloth. Serve as a tequila shot or with your favorite margarita recipe.